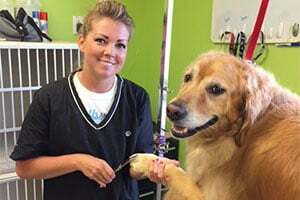 Whether your precious pooch is covered in mud or getting ready for a black tie affair, Willow Wood Dog Grooming and Spa can make any dog sparkle and shine with our professional dog grooming services for clients in the New Albany, Westerville, and Columbus, Ohio areas! Our professional dog groomers, stylists and bathers take special pride working with each pet. 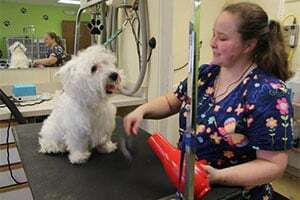 We use the latest equipment for dog grooming, including the advanced Hydrosurge system that gives a massaging, deep-cleaning bath. From poodles to pomeranians and dalmations to danes, we can have your pet looking its best! Leads to less shedding, healthy skin, and a healthy coat. Your dog will become accustomed to being bathed and actually enjoy the experience! We use high quality and customized grooming products at a great value. No lifting and struggling at home getting your dog into the bathtub! Best of all… dogs who smell and look great receive lots more hugs at home!